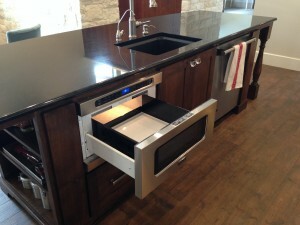 Universal design is a consideration in the design of all Jenkins Custom Homes. As today’s Baby Boomers have watched their own parents transition into assisted living homes, they are more interested in an alternative option for themselves. A 2011 AARP survey revealed that more than half of boomers view aging in place as a major long term care (LTC) concern, 49 percent supported the availability of LTC services for aging in place, and 59 percent strongly supported redirecting nursing home funds towards home- or community-based services instead. The 78 million plus boomers have a powerful voice: Aging in place is now a hot industry, with products, programs, and professionals designed for consumers who want to stay home. Proof positive—Google “aging in place” and you’ll get an impressive 105 million hits. It’s a dynamic niche, and one that’s evolving as quickly as the boomers and seniors determined to stay home. Proper lighting is absolutely critical to avoiding accidents. Motion sensor activated lights are a wonderful solution. You should have at least one step-free entrance (either at the front, back, or side of the house) so everyone, including wheelchair users, can enter the home easily and safely. Access to essential rooms without the use of stairs makes life more convenient and safe for residents ages 0 to 100. A person in a wheelchair can reach light switches that are 42-48 inches above the floor. Thermostats should be placed no higher than 48 inches off the floor, and electrical outlets 18-24 inches off the floor. Keep these measurements in mind when modifying or designing your home. 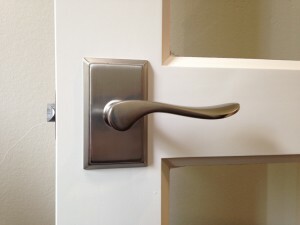 Consider selecting lever-style handles for (painless) ease of use in place of twist/turn doorknobs and faucets. Learn more about The 7 Principles of Universal Design.